Shelled Guara almonds from the Alpujarras, Andalusia, 500g bags. Those almonds come from small organic certified producers, and not from large monoculture orchards like for Californian almonds. Of course, they have not been irradiated like most of the ones you can find in stores from California. 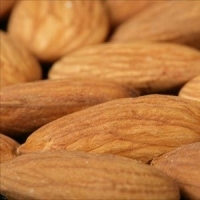 Shelled almonds should be stored in a dry cool place, and can be kept for months.